Want to do something extra special for the one you love on Valentine’s Day? 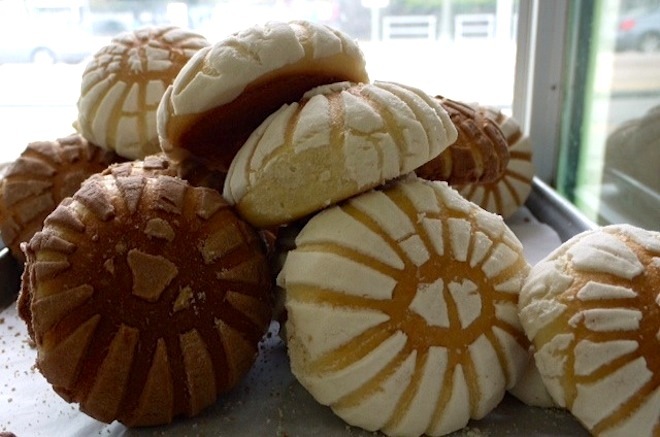 Stop by the many panaderias mexicanas (Mexican bakeries) found all over Los Angeles and pick up a selection of tempting, colorful rolls, twists, and pockets of candy-coated felicity to go with some Chiapan coffee from your favorite roaster. 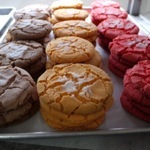 The modern Mexican tradition of baking began with the arrival of wheat behind the cold, ambitious march of the Spanish conquistadores, which then flourished alongside skilled French bakers during the reign of the Hapsburg monarch: Maximiliano. 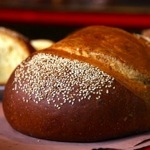 Today, Mexico has more varieties for baked sweet and savory bread—Ricardo Cervantes of La Monarca Bakery claims there are more than 1600 varieties—than any other country and L.A. just happens to have the highest number of panaderias outside Mexico. Here is a guide to the most common and regional shapes you’ll find in any panaderia in town to help you deliver the sweetest love letter to your significant other this Valentine’s Day. Conchas — These seashells are the most iconic of Mexican pan dulce, consisting of domes covered in a puzzle of crystallized sugar squares. 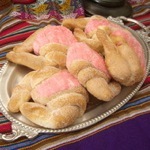 Photograph courtesy Bread Factory Inc.
Cuernos —The horn-shaped breads come with flashes of luscious stripes, or plain with a thin, shiny outer shell. Elotitos — These little ears of corn are filled with chocolate, or other flavors, and covered with a generous sprinkling of sugar—these are made for dipping in milk or coffee. 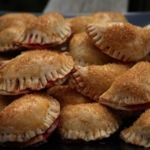 Empanadas — The fillings for these triangular turnovers vary by region, but expect to find guava, pineapple, sweet cream, and apple. 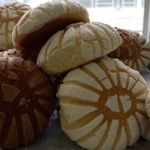 Galletas — Firm, crumbly cookies are hot items at any panaderia—try some the regional varieties like hojarascas from Monterrey, or coricos from Sinaloa. 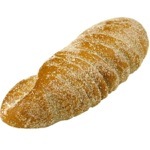 Orejas — Lend him (or her) your brittle, buttery ear of bread, and you’ll hear whispers of sweet nothings on this special day. 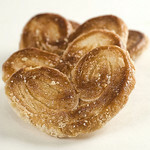 These are also called “elephant ears” or—if you happen to find yourself in a French bakery—palmiers. Pan de Muerto — Though not likely to be found around Valentine’s Day, pan de muerto is still worth a shout-out, since you’ll want to be on the lookout for it when it is available during the traditional Mexican Dia de los Muertos celebrations in late October and early November. 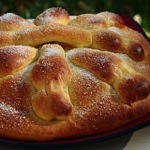 Pan de muerto is a citrus-flavored bread usually decorated with crossed strips of dough on top that symbolize bones. Though the outside is firm, the inside collapses wonderfully as you bite into it. 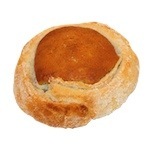 Pan de Yema — In “Oaxacalifornia,” this stony, egg and aniseed flavored roll is ideal for ejoying alongside atoles (corn masa drinks), Oaxacan hot chocolate, or a warming cup of café de la olla (cinnamon spiked coffee). 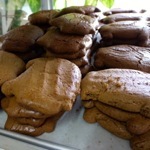 Puerquitos (or Cochinitos) — These cute little brown-sugar-tanned pigs are a standard of the panaderia that will have you crying su-weet!